Anything Marvel has been releasing about their biggest film till now, Avengers: EndGame, is getting dissected minutely by the fans. The marketing team of Marvel is very careful about what they show in the trailers, and the MCU chief, Kevin Feige, has mentioned that the promotional material does not reveal the content of the film more than what's shown in the first 15 minutes of EndGame. The trailers did a fine job of teasing us with the mood of the film and its (surviving), without not revealing how it will proceed ahead with its premise. 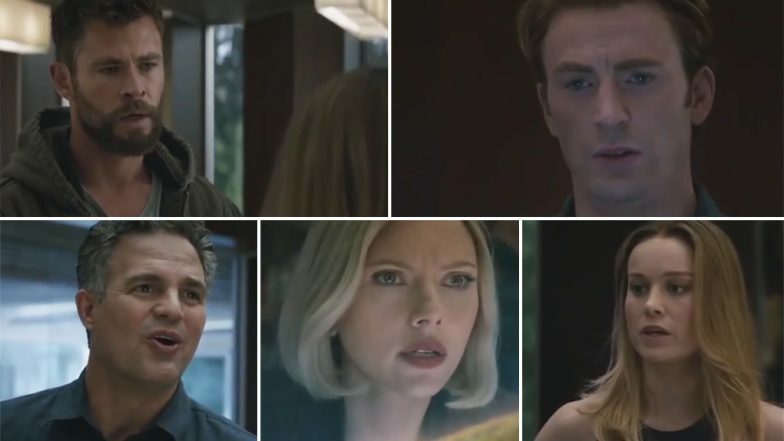 Marvel Streams 10 Minutes of Avengers Endgame Footage, Russo Brothers’ Film’s New Set of Spoilers Hits the Internet. However, the subsequent promos are offering us a lot more insight about what's going to happen. Like Tony Stark and Nebula, who are stranded in space, will reach Earth. Or the surviving Avengers will take the fight to Thanos. Now we have a new footage that is a scene from the movie, that shows us how attacking Thanos is what the Avengers are aiming for right from the start. The footage has Black Widow (Scarlett Johannson) suggest the team that they find the stones and reverse the snap. Captain Marvel (Brie Larson) seconds her idea and proposes to take down Thanos to get the stones. Captain America (Chris Evans) agrees with her on this. When Bruce Banner (Mark Ruffalo) points out how they can beat Thanos this time, when they couldn't do it the last time, Captain Marvel tells them confidently that they have her now. A sceptical James Rhodes aka War Machine (Don Cheadle) asks her why she couldn't be there with them in the past. Captain Marvel has a perfect reply for that - she was busy protecting other planets because they never had the Avengers protecting. This leads to that quite popular scene from the trailer where Thor tries to size Captain Marvel up and in the end, says 'I Like Her'. Avengers: Endgame New Trailer - Chris Hemsworth's Thor is Hitting on Brie Larson's Captain Marvel and We Are Totally Loving It (Watch Video). The above footage looks like what Marvel had screened during the press interactions and screenings. Going by Black Widow's hair, it looks like it is a continuation of the scene after the mid-credit scene from Captain Marvel where she meets the Cap, Black Widow, War Machine and Banner asking for Nick Fury (Samuel L Jackson). Also, to be noted here that, Iron Man (Robert Downey Jr) and Nebula (Karen Gillan) are missing, which means they could still be stranded in space. So when Nebula arrives on Earth, she could lead them to where Thanos lives now. One more thing we noticed is that Ant-Man (Paul Rudd) is missing, as well as Rocket Raccoon (Bradley Cooper). The latter might be moping in the corner, but Ant-Man's absence is interesting. This might put some strength into a fan theory that Avengers might get to Thanos and kill him early to get the Stones but fails to reverse the Snap. Which is where Ant-Man and his journey into the Quantum Realm might come in handy. Avengers: EndGame is scheduled to release on April 26. Avengers Endgame Advance Booking in India: Tickets to Go on Sale from April 21?